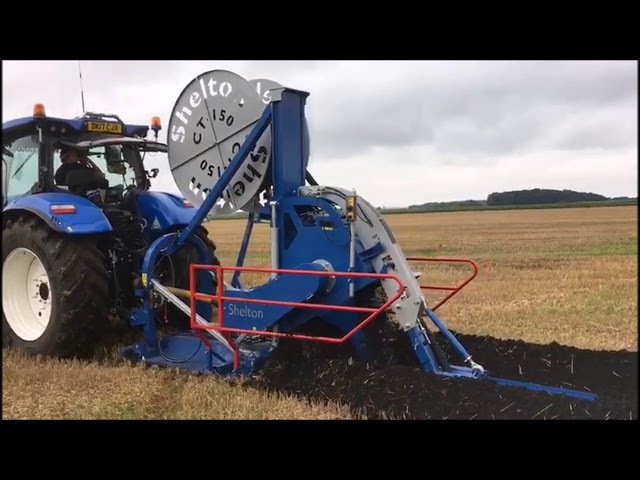 Make waterlogged fields a thing of the past with the Shelton CT150 Agri Chain Trencher. This versatile trencher has a maximum digging depth of 1.5 metres (5 foot) and can use laser grading to evenly install land drainage pipes on agricultural land giving longevity and efficiency to a drainage system. Tractor mounted and easy to operate, this machine gives you the opportunity to carry out drainage work, in house and at a time to suit you, during optimum trenching conditions for the best results. In 2014 we highlighted a gap in the market for an affordable agricultural trencher for a number of reasons, mainly that many farms needed to either renew or improve their drainage systems as the farm drainage installed in the boom time 1960’s and 70’s was coming to the end of its life. Establishment costs for large drainage equipment make small jobs unaffordable and as many farmers are facing financial pressures DIY drainage becomes an attractive and affordable proposition. We also researched the market for installing ground source heat pumps due to the upsurge in installation as government funding grants were taken up by many homeowners. We identified the following ‘must have’ criteria before we started the design of the machine in order to appeal to our target market (farmers) UK and overseas: The ability to operate on tractors in the 150-200hp range (the most popular sized tractors found on farms) to make in house drainage viable for farmers, accurate laser grading capability, a mechanical drive to the digging chain (for the most cost effective and efficient power transfer), a constant digging angle (to reduce power consumption and digging chain wear) and the capability of installing pipe in a one-pass operation. In September 2015, we were awarded a Rural Development Grant to progress with our development. The grant was key to the success of the project as it enabled us to use computer aided design to develop the production version of the CT150 and to invest in the marketing of the product in new markets. The trench depth is controlled hydraulically from the tractor cab and the pipe layer lifts out of the ground for easy setting in at the start of the trench. The pipe is laid on the trench bottom automatically through the pipe layer which is fed from the pipe reel. The digging chain is driven from the tractor PTO. Pipe reel and pipe layer as standard to fit 80mm and 100mm pipe. Additional pipe layers available on request to fit 160mm and 200mm pipe. Laser or GPS control system and extra pipe layers can be fitted on request.